I identify as a queer Jewish New Yorker femme. Sometimes I describe myself as one half-moneyed Long Island Jew and one part New Jersey white trash. I come from a mixed class family. A mixed European immigrant family. A family with a lot of historical schizophrenia and a family that gave up a lot to become and be white. My mother and other people close to me were incarcerated when I was in my teens and early twenties. What I’m working for is a world where no kid ever has to sit in a plastic chair and watch their parent walk out in chains. I have been working with young people since I was a young person. I co-founded Social Justice Leadership Academy — a 5-day a week/5-week activism, art, and cooking summer camp for teens in Hudson in 2014. I wrote the curriculum for the first summer but have since passed that project on. I fought really hard to implement a harm reduction organizing project that I called Re-Up in opiate ground zero Massachusetts. I trained substance users and sellers together, and it was the best project I’ve ever worked on. I’ve also taught high school summer school in Brooklyn, college classes at the New School, and oral history workshops. I’ve worked in solidarity with indigenous communities since 2007 as an archivist on a music repatriation project based in Utqiaġvik, Alaska. Led by my mentor Aaron Fox, the project successfully transferred cultural patrimony, intellectual property rights, and the money associated with that, back to the community. Since then I’ve continued to do behind-the-scenes work for local and national indigenous organizations. I was asked by Oceti Sakowin leadership to come to Standing Rock and “get the white people,” which resulted in on-site trainings, online trainings, and a comprehensive resource packet for people new to decolonization work. I worked at the Ruckus Society for two and a half years where I did a little bit of everything. I am most excited about mentoring up-and-coming nonviolent direct action trainers and innovating on tactics. Additionally, I am a civilian ally in the New York City Chapter of About Face: Veterans Against the War and support formerly incarcerated folks training each other to become personal trainers with A Second U Foundation. The Ruckus Society is a multiracial network of trainers and practitioners catalyzing strategic nonviolent direct action to advance frontline-led movements for justice. Ruckus’ model is to come when and where we are called. Organizational partnerships tend to happen through organic relationship building. In terms of the Dream Defenders (DD), Char (who has been a longtime DD volunteer organizer and direct action point person) was at the Ruckus convened Combahee Alliance gathering in 2015, so there was already a baseline relationship. I had met Phil in upstate New York at the Watershed Center five years or so, and we met again at the CSS Advanced Training (AT), where I also met Nailah and Rachel. Since connecting with them at the AT, I have helped organize a direct action training for their membership (sending two Ruckus network members to lead it), and provided informal feedback and unstructured idea generation with DD leadership, which felt characteristic of Ruckus. Our homies call us and say, “Hey we’re working on this thing but are stuck, can we hash it out with you?” I’ve had those kind of conversations with Nailah, Rachel, and Phil a number of times since the AT. The GEO Cages action came about because Char and I had already been building around NVDA trainings and escalation, and I was asked to come in to support a national day of action DD was planning. Basically, this is all to say that we (DD + me) already had a practice around spitballing ideas. My role in the movement ecosystem is often times as a “spitballer” and Ruckus has provided informal and often times short-timelined creative support. 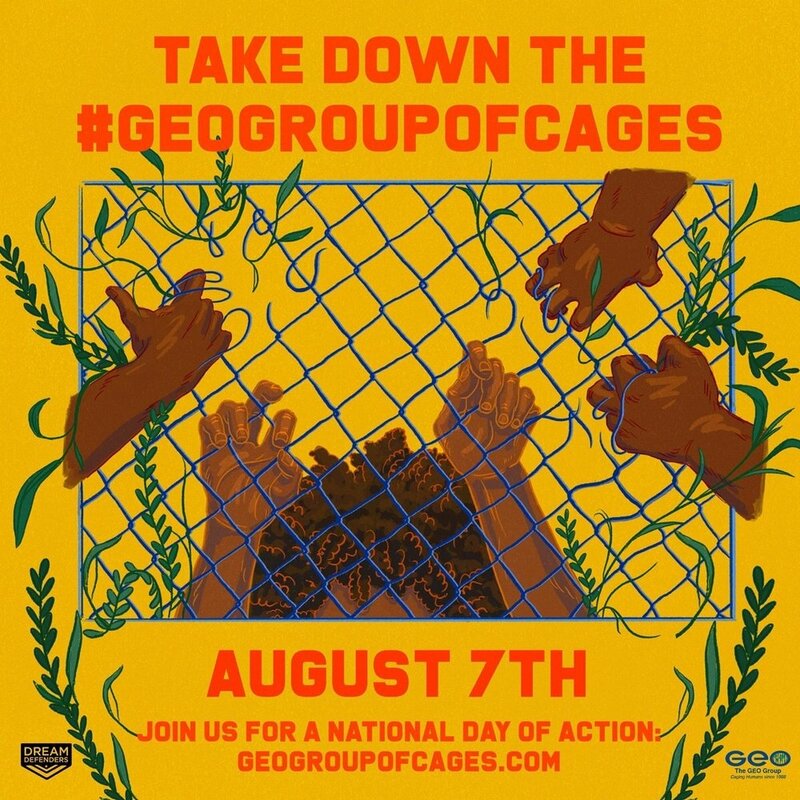 This project was a national day of action targeting GEO Group – the largest vertically integrated carceral corporation who profits off of the mass incarceration of black people as well as migrant detention facilities. The Dream Defenders had already been working against GEO since Florida elected officials take money from the private prison industry. This summer, mainstream attention on the family separation crisis peaked, which presented an opportunity to leverage the growing outrage into revealing the corporate motivations behind caging, and connect black and brown struggles. The Dream Defenders’ campaign goal was to make GEO politically toxic. The national day of action was designed to link mass incarceration with migrant detention (no family should be separated) and underscore the evilness of for-profit cage corporations. The primary action was in Boca Raton Florida where GEO has its current headquarters and is building a new office. The action took place between both locations and the narrative there emphasized GEO being unwelcome in the community. There was a solidarity action in NYC organized primarily by a couple members of my affinity group and I (a mixed group led by black, brown, and white queers). Leading the tactical implementation (how do we actually make the damn thing)! I spent one really hot July weekend testing different iterations of a cage, support structures, etc. Organizing an affinity group solidarity action in NYC (the following weekend — also really hot — my friend Sandy and I ran two days of rigorous deployment practice with the team. Our day of deployment we got the cage up in about 60 seconds. Boom). I could not have done this on my own! Big shout out to the NYC crew who worked really hard to make this happen! The website was the one area of the action I thought DD and I could have spent more time and energy developing. Originally my idea was to make it a spoof of the GEO website — it would look exactly like GEO’s real website but would have content that was like, “What we do is build cages and make tons of money doing it.” Kelly did this for Energy Transfer Partners during Standing Rock and it was dope. But instead the website became a call-to-action site.There wasn’t much time to really encourage self-organized distributed actions, but the DD did have solidarity actions in over 10 cities! Also, the GEO logo hack (made by Angus at CSS) is bomb and we used it not just on the site but in the action visuals as well. What were we trying to accomplish? The Dream Defenders’ campaign goal was to make the Florida-based GEO Group politically toxic so that no gubernatorial candidate would take money from them. The dilemma we faced was that in order to brand GEO as toxic, people needed to first know about GEO. (Phil and I talked a lot about how this was the opposite of trying to fight McDonalds where you can riff on their slogan, logo, etc because it exists in the popular psyche). So my idea was to boil down GEO into one meme — the cage. And the goal became to make GEO synonymous with cage (and profiting off cages). How does this work “Change The Story”? I don’t think I would say that this action necessarily changed the story. We weren’t going after GEO’s story, we were looking at the status quo story. I think we really successfully hitched our cart to a mainstream liberal story and pushed that story to the left. In terms of imagination building power, this was the first and only action I’ve done where the police arrived on scene, saw what was happening, and then left. The whole scene was incredibly haunting. Everybody, and I mean everybody, stopped what they were doing and fell silent. And I believe it was in part because people were imagining themselves, their kids, their family, in the cage. 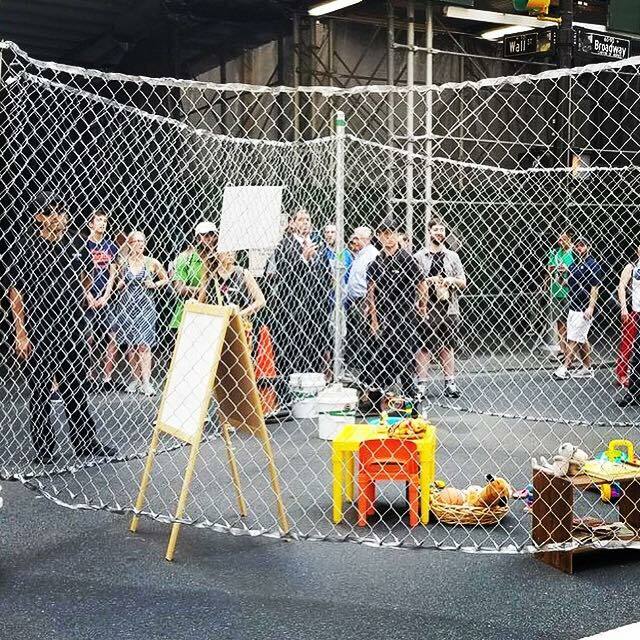 My affinity group in NYC put a lot of thought into what would and would not go inside the cage, and it was essential that there not be any people (or objects acting as people, mannequins, dolls, dolls stuffed under emergency blankets to look like bodies, etc). In our cage we put a children’s play table with little colored chairs, a little easel, and an assortment of toys, books, stuffed animals, a baseball mitt, etc. It was a scene that evoked a normal childhood but no children were there. We wanted people to see their own children in there - because imagining that would move people more than if they saw children that didn’t look their children. Also, since the goal was to connect migrant detention to the mass incarceration of black people, we wanted to underscore that children everywhere could be caged. The underlying assumption we wanted to prove was: no child should ever be in a cage. And secondarily, that no one should profit off children in cages. We conveyed that second assumption by having members of our team dress like security contractors (black cargo pants, ball caps, wraparound shades) and menacingly police the cage. We also had two more people with the flippy car wash signs (like Tessa Thompson in Sorry to Bother You) that said on one side — KIDS IN CAGES — and on the other — GEO GROUP PROFITS — to make the association really literal in people’s minds. Here is the best piece of earned media that a colleague of mine made, at Now This. Story-based strategy is a practice of telling stories to move people to take action. SBS is a method of analyzing your opposition’s story so you can tell a story that is more compelling. I would say SBS teaches you to ground your organizing in creativity. A way of organizing that invites people into a story of a more just and equitable and beautiful future, a story that people don’t want to just hear, but actually live in. Drama Triangle: this action had a super clear villain and a super clear victim. The hero role was more fluid: open to being DD, their young girl spokesperson, potential elected officials who refused to take GEO money for their campaigns. The hero was not so much the focus of it, after all the goal was to create a villain. Cornerstones: the DD had already worked on this at the Advanced Training! YAY! I know CSS doesn’t use point of potential but Ruckus does and I thought this was the ultimate point of potential — no one could have foreseen that this would be the moment that the migrant crisis not only became front and center — but also became a family (as opposed to “jobs”) issue. This was a moment with great potential: we could reframe the issue of migrant detention, broaden the issue of mass incarceration, and make those linkages between profit and policy. In development, the DD and I referred back to their original cornerstones and also had to pivot a little bit to connect mass incarceration more to the migrant crisis. Points of Intervention: In terms of assessing where the cages would go, Florida was the point of destruction and production-- where violence was being done and where GEO’s profits were being produced. In New York, the cage ended up being at a point of assumption – on Wall St — to make real the underlying assumption that caging/detention/incarceration is financially motivated. We also did this with a banner drop directly outside ICE and GEO’s local office, a few blocks north of Wall St and the cage. Rapid prototyping: we went through a lot of different cage ideas: small cages, big cages, cages inside, cages outside, cages with emergency blankets, etc. We also prototyped the hashtags and slogans a lot. What parts of SBS Theory did you find yourself using or thinking about throughout this project? Memes, memes, memes, memes. This whole action was all about making a meme. For months afterwards people were like, “that cage action was dope.” The cage worked as a capsule to carry the story of what was happening to these families at the hands of these institutions. Overall, I thought a lot about how to use battle of the story when the opposition isn’t even well known. GEO is so undercover, which allows them to operate so nefariously and under the radar. But, it actually felt really empowering to be able to define GEO as evil from the jump for a new audience. Unlike McDonalds, where many people could have longstanding connotations with it, GEO was a blank slate for almost everyone so it felt like we didn’t have to fight their story. I also thought a lot about audience. I think with more time, we could have fleshed this out more. In NYC, where New Yorkers looove to refer to their city as an immigrant city, we wanted to reach liberals with children who were sympathetic to seeing images of kids locked up, but weren’t making connections to the corporate interests behind these policies and the profits. In Florida, the audience seemed to be more DD constituents and people living in the communities near the GEO office. It was amazing how the story of the DD’s resistance to GEO became a part of the overall narrative strategy. GEO sent DD a cease and desist letter saying, “You must stop saying GEO puts kids in cages.” Once Char read that to me on the phone, it was the greatest affirmation ever - that our story was exactly the story GEO and their shareholders did NOT want to hear. And then DD pushed out publicly that GEO was trying to get them to stand down, in effect creating another drama triangle. See above about the website. More time, more cages, more cities. Do you think SBS will change how your team (LJ + DD + Ruckus) relates to future collaborative work? How? And why? I would like to think through more how direct actions and creative interventions reach your audience and actually move them to action.